The Academic Office is looking for feedback from parents, students, staff and community members on ELA/ELD materials that will be selected for the 2018-2019 School Year. Please take a look at the materials listed below and on display at the Serna Center then provide feedback through the survey links below by February 28, 2018. Click on the links below to to explore the materials online. The FAIR Education Act (also known as Senate Bill 48) was signed into law in 2011. It requires that California public schools provide Fair, Accurate, Inclusive and Respectful representations of our diverse ethnic and cultural population in the K-12 grade history and social studies curriculum. School libraries are at the core of learning in today’s information age, and are one of a child’s first opportunities to discover the wondrous joys of reading and exploration. Here at SCUSD we understand the importance of sending our students on to college and careers with the skills that will allow them to be successful, accomplished and create a positive impact within their communities. We strive to empower our learners through the explicit teaching of 21st century literacy skills and to create a spark of joy around lifelong learning and foster lifelong reading. What are your hopes and dreams for your children and the children in your community? That they become independent thinkers? Dedicated problem solvers? Excellent communicators? That they are happy, healthy and have fulfilling relationships with others? That they love school? 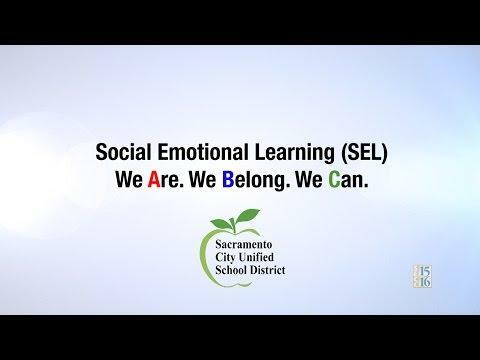 At SCUSD, we are committed to providing schools that are safe, caring places for children to enjoy learning, be intellectually challenged, make lasting friendships and master essential standards of learning. Download the SEL Core Competencies and Indicators.